Published in the years following 9/11, David Dark's book The Gospel according to America warned American Christianity about the false worship that conflates love of country with love of God. It delved deeply into the political divide that had gripped the country and the cultural captivity into which so many American churches had fallen. In our current political season, the problems Dark identified have blossomed. The assessment he brought to these problems and the creative resources for resisting them are now more important than ever. Into this new political landscape and expanding on the analysis of The Gospel according to America, Dark offers The Possibility of America: How the Gospel Can Mend Our God-Blessed, God-Forsaken Land. Dark expands his vision of a fractured yet redeemable American Christianity, bringing his signature mix of theological, cultural, and political analysis to white supremacy, evangelical surrender, and other problems of the Trump era. 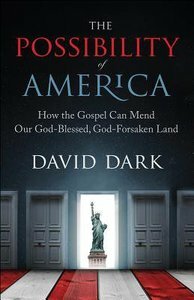 About "The Possibility of America: How the Gospel Can Mend Our God-Blessed, God-Forsaken Land"
David Dark (Ph.D., Vanderbilt University) is the critically acclaimed author of Everyday Apocalypse, The Gospel According to America and most recently The Sacredness of Questioning Everything. He has had articles published in Paste, Oxford American, Books and Culture, Christian Century, among others. A frequent speaker, Dark has also appeared on C-SPANs Book-TV and in an award-winning documentary, Marketing the Message.